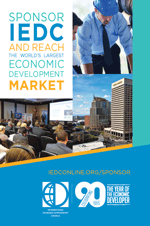 Gain access to the mind share and market share of the economic development community by becoming a sponsor of IEDC conferences. Sponsorship opportunities allow you to attract new clients and enhance your business relationships with current customers. As an IEDC sponsor, you will earn the recognition of your peers for your commitment to and leadership in the economic development community. We offer a wide range of sponsorship opportunities to give you added visibility with and exposure to your peers and customers. Contact Shari Nourick at (202) 545-7339 or snourick@iedconline.org.